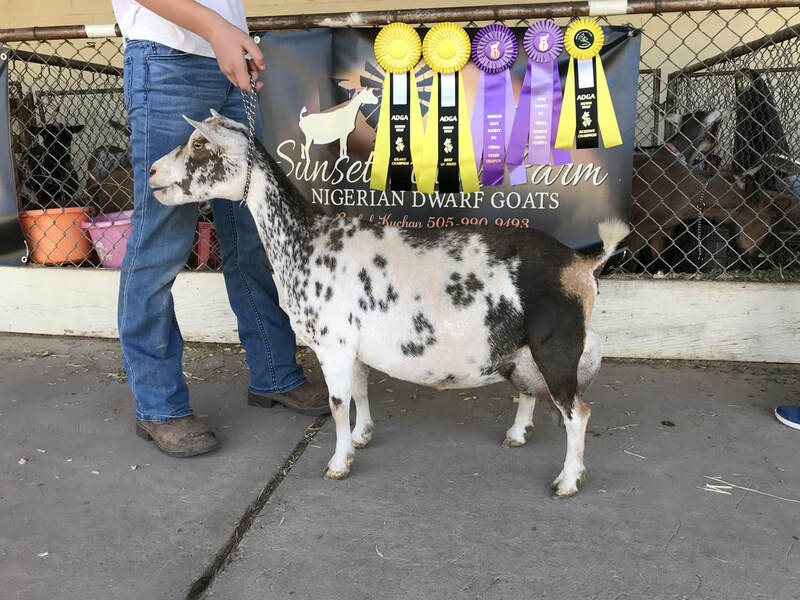 Hershey is our first home bred and raised Finished Champion! Hershey is the foundation doe of our herd. She is a beautiful very correct doe, she also is a powerhouse milker. Hershey will be in our herd for life. Hershey is now retired. 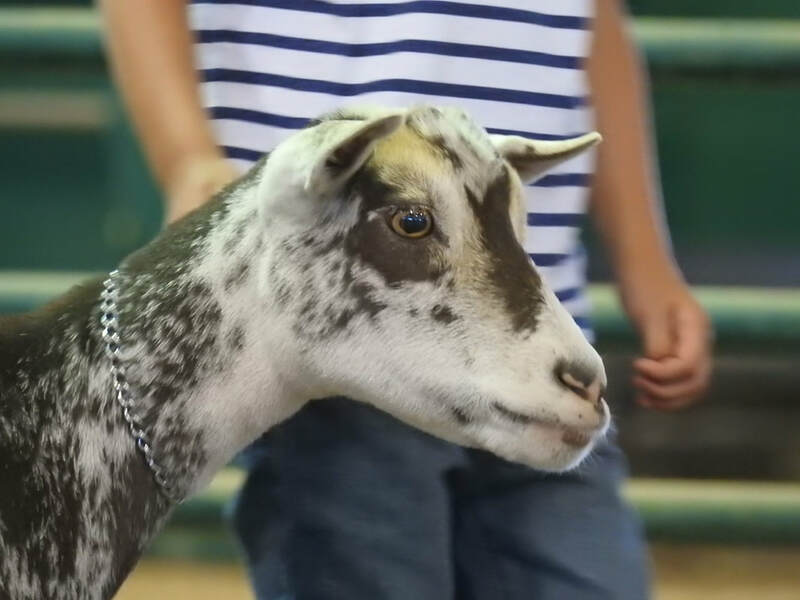 Hershey, State Fair 2016 Champion Challenge, taking second. 6 months into her 6th lactation. 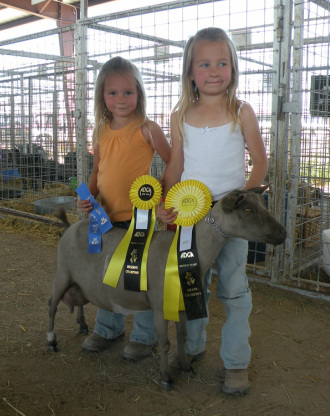 Shown by Emily, 8, at the 2015 NM Sate Fair. 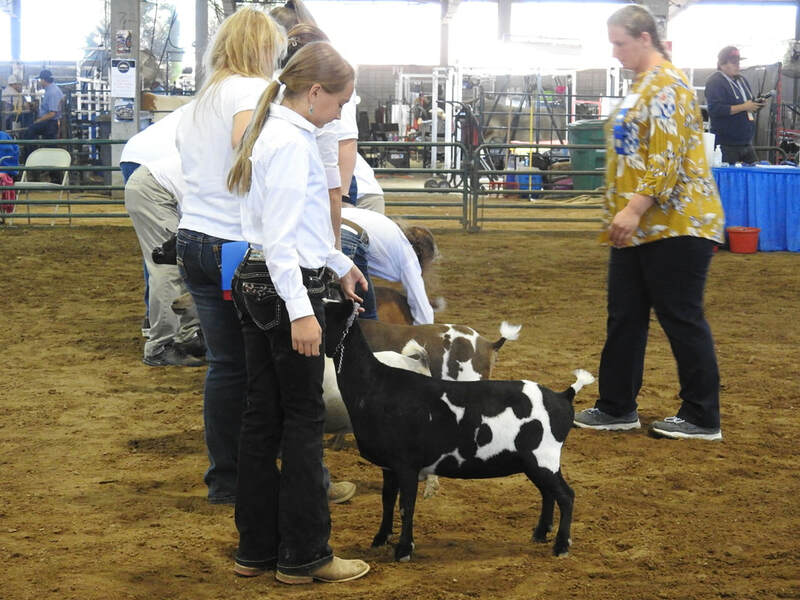 Grand Champion Junior doe. This doe is something special. I loved her from the moment she was born. 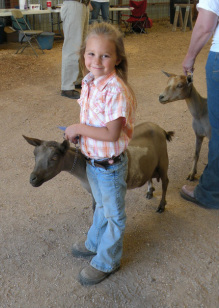 Chip took Grand Champion Junior doe at the 2015 NM State Fair, being handled by Emily, age 8. Chip is a deep bodied, angular, dairy doe. ​Chip is my favorite doe to milk. She is so quick and easy to milk with her butter soft texture, large open orifices and plump teats. She also has a very sweet personality. 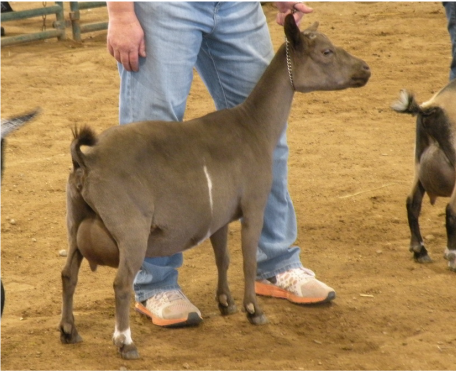 This doe is a repeat breeding, which produced my favorite doe, Sunset Plains DM ChocolateChip. Reeses does not disappoint. I might possibly like milking her even more than I do her sister Chip. 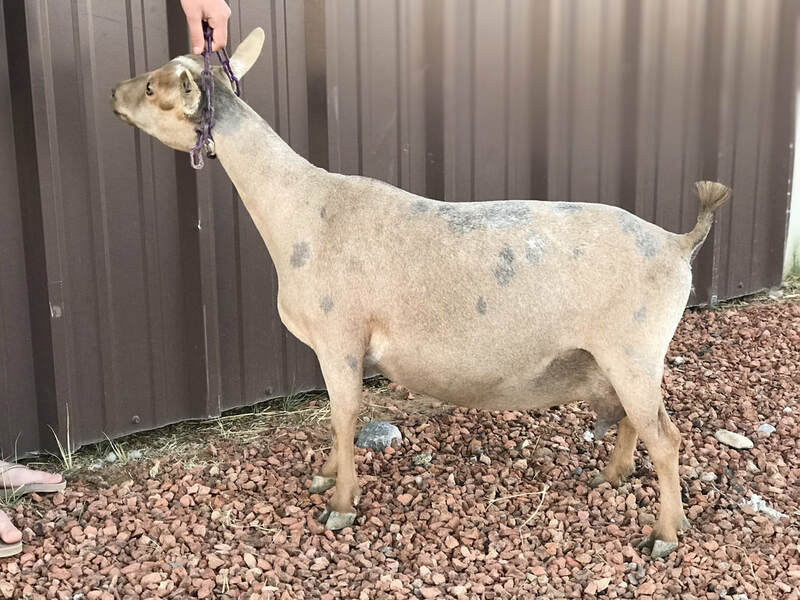 Reeses freshened in 2017 with a single doe kid, which resulted in an uneven udder, and again a single doe kid for 2018. I am really happy to watch Autumn mature. 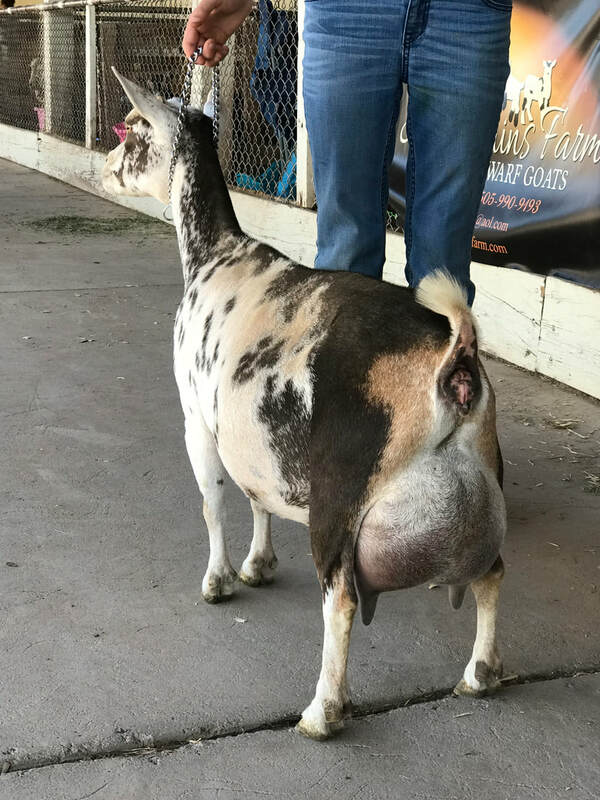 She is a lovely dairy doe, and I couldn't be happier with her fore, rear and lateral udder attachments. Autumn also exhibits good width throughout, which is something I am consistently seeing in Hummer daughters. Honey and her daughter Confetti. September 2018. I am so proud of this doe! I feel privileged to have a doe of this caliber in my herd. Take a look at that attachment and capacity! Honey is at the top of my favorite list. She milks out quickly and is easy to milk with her long teats. Honey fills her udder in 12 hours throughout her lactation. She has a will to milk. The icing on the cake is Honey's very sweet nature, I would take a whole herd of does like Honey. Party is following in her dam's hoove-steps, she is a lovely dairy, angular doe. ​This lovely doe is the result of a tight line breeding on King, I am very impressed with the outcome. This doe exhibits great width, a nice topline, level rump and tons of width between the hocks and throughout. Confetti's mammary system is shaping up to be a replica of her dam. 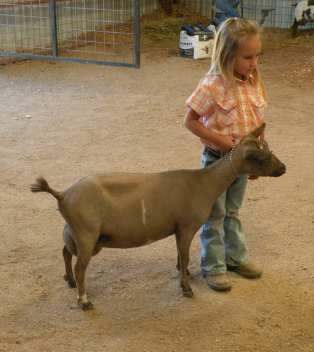 This doe kid is gorgeous!! I am thrilled to have Lacy here, she brings femininity, strength and dairyness to our herd. Just look at the pedigree this girl has. Shine's dam Shimmer has a very impressive LA Score of EEEE92. Shine is a gorgeous very dairy doe, with butter soft skin. 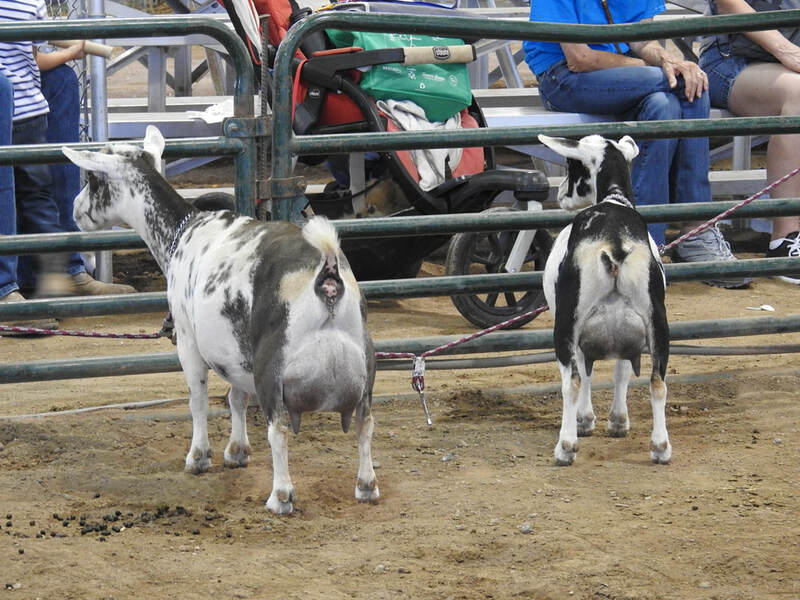 She has a capacious udder but I would like to see better teat delineation and larger teats. ​I had admired Shenanigan's dam for a few years in the Dill's herd. Take a look at that pedigree! Every relative has milking merits and SG grand dams. I am very excited to watch Shenanigans grow in our herd. 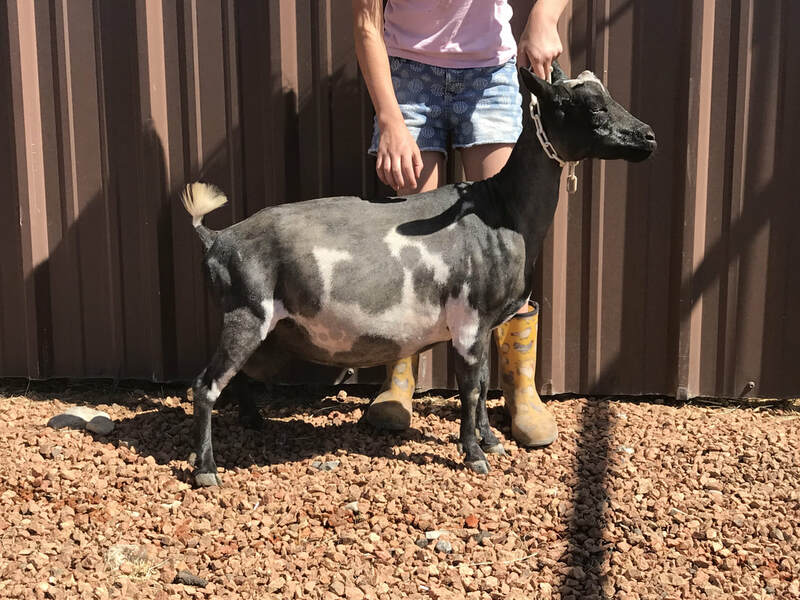 I absolutely love this doe, she is quickly moving up on my favorite list, she has the sweetest personality and took right to milking like she was born for it. Shenanigans milks out effortlessly with her open orifices, and even as a FF has never kicked on the stand, she is the first doe at the gate to milk everyday. Esther has matured into a lovely doe, being very correct. I love this does levelness, length and nice wedge shape. Esther has not disappointed us with her second fresh udder, milking 3.5lbs on her first test of 2018. 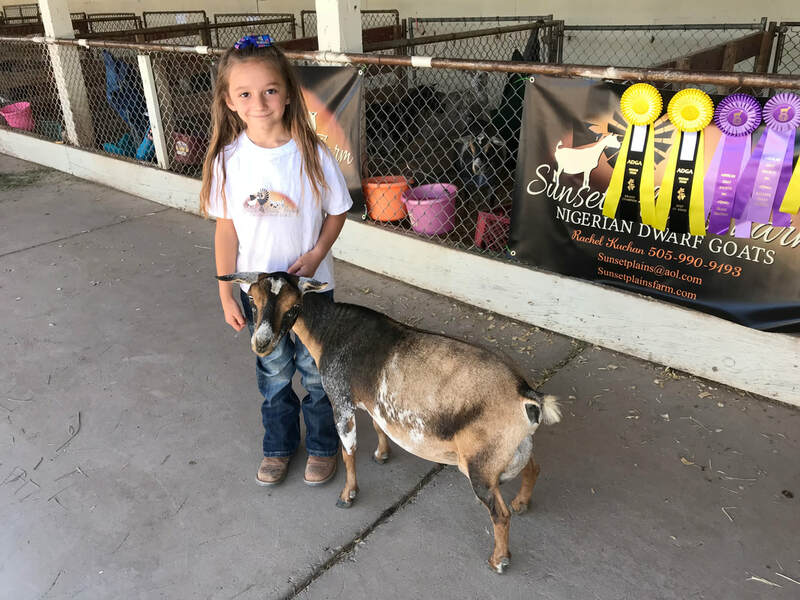 ​I have been impressed with Redstone Dairy Goats for some time, I am very happy to add Rabbit to our herd. Rabbit is a gorgeous doe, so sharp and angular with dairy skin, a wonderful brisket, flat bone, sharp withers and smoothly blended. Rabbit also has a wonderful demeanor. First Freshening two year old. I just love this little doe. Cricket is very small in stature. 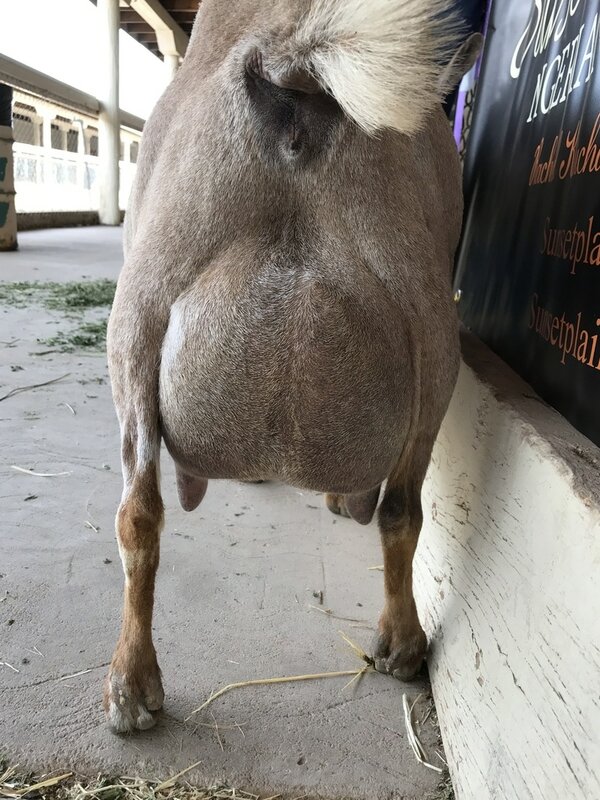 Cricket has wonderful udder structure, holding up very well as she ages. 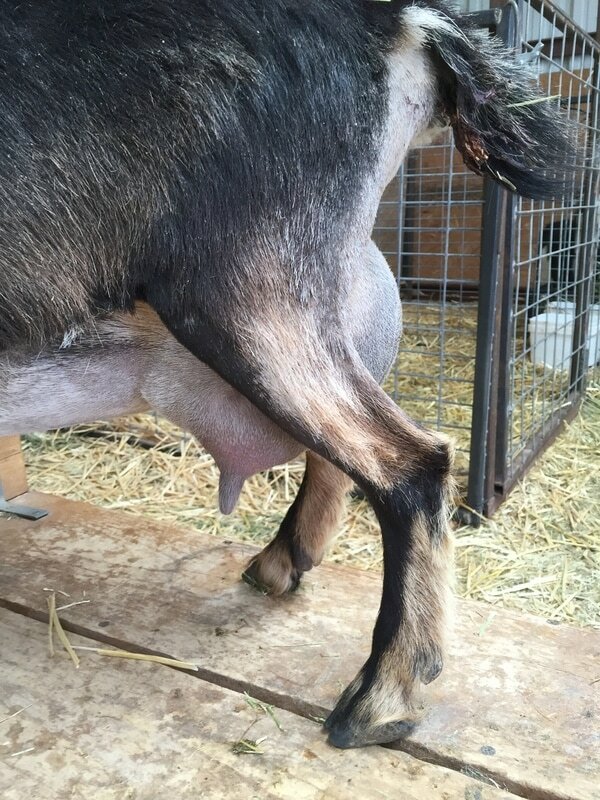 She has a lovely smooth fore, with nice texture and long milkable teats, also open orifices, her milk just flows. I have loved every daughter Cricket has produced. Marisol belongs to my daughter Natalie, she raised Marisol on a bottle when Natalie was only 3 years old. Marisol is a sweet natured doe and an excellent mother to her kids. Marisol is a pleasure to have in the barn with her willingness to milk and her calm quiet demeanor. 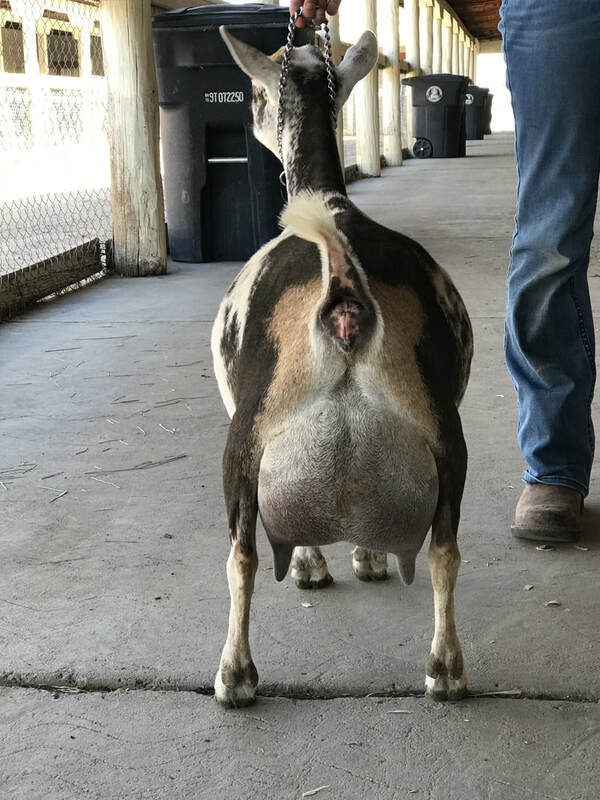 Marisol's 3rd Fresh udder, 2018. Marisol freshened with a single. 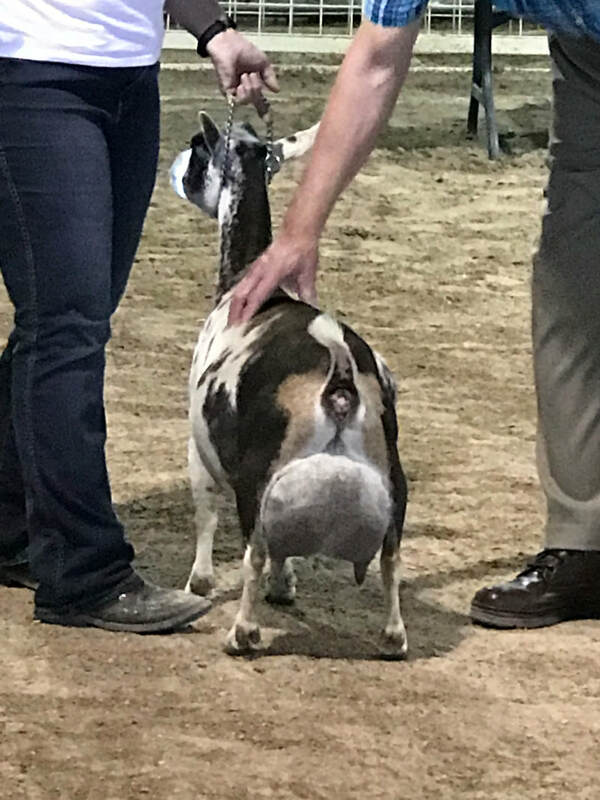 Dad watching over the herd at a show.